Utah is home to five national parks--the "Big Five," as they are called: Arches, Bryce Canyon, Canyonlands, Capitol Reef, and Zion. We managed to visit them all this year. 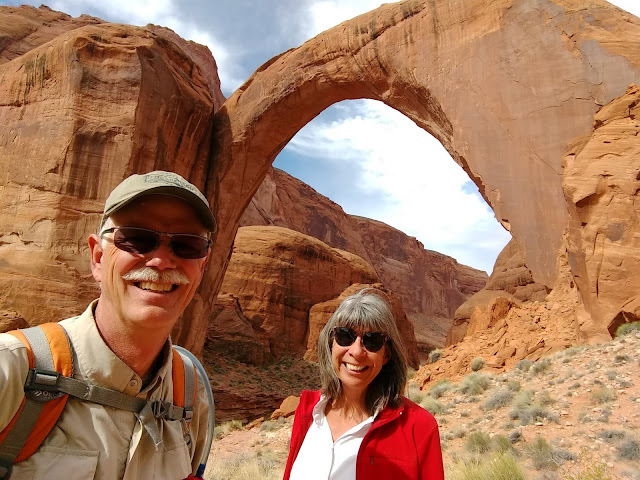 In addition to these parks, southern Utah has several national monuments and recreation areas.We visited Escalante in the spring, so this fall we allocated time to see Natural Bridges, Bears Ears, and Glen Canyon. Natural Bridges National Monument is the oldest of this group, set aside in 1908. It has three large bridges that you can hike down to. Wondering what the difference is between an arch and a natural bridge? The Natural Bridges National Park website gives this explanation: Bridges and arches are both fragile, natural rock sculptures. Both are formed with water and time, but with different processes. Running water carves natural bridges, while seeping moisture and frost shape arches." They bridges in the park not always easy to photograph, as you need to get close to get sky in the background, and then it's too hard to fit them into a picture. The picture above is a four-shot composite. The three bridges in Natural Bridges are easily accessed by a loop road, which makes it pretty easy to see and hike the whole park in a day. Definitely worth a visit when you are in the area. Bears Ears is one of the newest national monuments. And until recently, it was one of the largest, covering a large area of southeast Utah surrounding Natural Bridges and extending north to Canyonlands National Park. Bears Ears is named for the two buttes that from a distance look a little like the ears of a bear. If you squint. And have a good imagination. As a new national monument, it doesn't really have any facilities yet. No visitor center, or maps, or paved roads... But what it does have is the potential for uranium, which is why the current president has greatly reduced the size of Bears Ears. The land that Bears Ears sits on is still BLM land, but since it doesn't have the protection of a national monument anymore, it is now open to mining. For more information on filing your mining claim, please go here. The Bears Ears area is not really conducive to farming; it's too dry. There's also no timber here, or other resources, other than uranium. But it is home to many many ancestral sites. The ancient people who lived here hundreds or thousands of years ago managed to eke out a living, and they often left cliff dwellings. We found a few of these places, either by asking locals or by asking at a NPS visitor center. They are not well advertised since the park service doesn't want people ruining them. And while they're not as impressive as Mesa Verde, it's pretty cool to hike off trail and locate them on your own. Here's a portion of some cliff dwellings. These are viewed from across a canyon, which makes them easy to see but not easy to get to. Probably why they are still largely intact. Here's a different cliff dwelling, also viewed from across a canyon. This one did not require any hiking; you just need to know which gravel road to take out of town, and where to look. Here's one we found when hiking on a trail in BLM land. We knew that there were cliff dwellings located in some of the side canyons, but that they were not marked and there weren't established trails to them. Finding them was rather exciting. Of course we did not touch or enter the sites. This one is also located in a side canyon, with no real trail to it. It took some scrambling to get here, and the dwellings are still way high overhead on a ledge. We could see holes and marks where a ladder had been placed, so we know how the ancient people got in and out. We can only imagine that the whole Bears Ears area is dotted with ancient sites like these. But what will happen to them if we start mining for uranium in the area? It may be helpful to look at what happened with past mining projects. There's a massive cleanup going on just outside of Moab, Utah. After a uranium mining operation shut down, it left a huge pile of tailings alongside the Colorado River. The massive fish die-offs indicated that there were toxins (ammonia in this case) leaching into the Colorado. The cleanup has been going on for years and is currently estimated to cost the taxpayers around $720 million. Read more about the Moab Uranium cleanup and the UMTRA Project. We had seen the uranium mine cleanup project in Grand Canyon National Park (another multi-million dollar cleanup, completed in 2009) as well as old abandoned uranium mines in Capitol Reef. You can't help but wonder if the costs of cleanup greatly exceed the value of uranium extracted. The mining companies walk away with the profits and leave the cleanup of their mess to the taxpayers. Will we be dumb enough to let this happen again? Our last stop in Utah was Lake Powell in the Glen Canyon National Recreation Area. This huge lake was formed when the Glen Canyon dam was built in the early 1960s. At 188 miles long, most of the dam isn't visible except from a boat. Currently the lake levels are down about 100 feet from the high-water mark.While there is normal water level variation annually due to the snow melt in the Colorado Rockies, this year the lake level only rose 4 feet instead of the more typical 40 feet. The reservoir is at about 38% of capacity, and it would take a decade of above-average rain and snow to restore it to full capacity. The future of boating here doesn't look good. What does look good is Rainbow Bridge National Monument, accessible by a 50-mile boat trip followed by a short hike. We really enjoyed southeast Utah. But as winter is coming, it's time to continue working our way south to winter quarters in Tucson. But not before another stop at the Grand Canyon, which will be our next installment. We're the Vogels. Learn more about us.